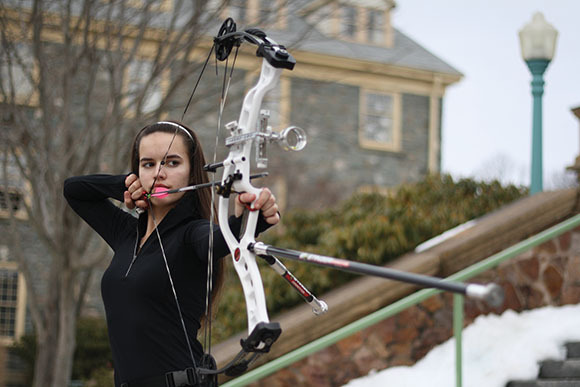 Sixteen-year-old Rachel Corney shoots with a compound bow, which looks more mechanical than a traditional recurve bow. Rachel Corney ranks seventh nationally in her category for archery. Corney, a 16-year-old student at Auburn Drive High School in Cole Harbour, started training two or three time a week almost a year ago, and is in the running to represent Nova Scotia at the 2015 Canada Games in Prince George, B.C. “I remember when I was younger that I always just wanted to try it,” says Corney. Watching archers in movies had her dreaming of one day holding a bow of her own. A few years ago, unknown to her, her mother began searching for opportunities. Corney was enrolled in a beginners club offered by a local Canadian Forces base. Marilyn McLaren and coach Bruce Graves, an archer for 45 years, spotted Corney’s potential only a few weeks later. 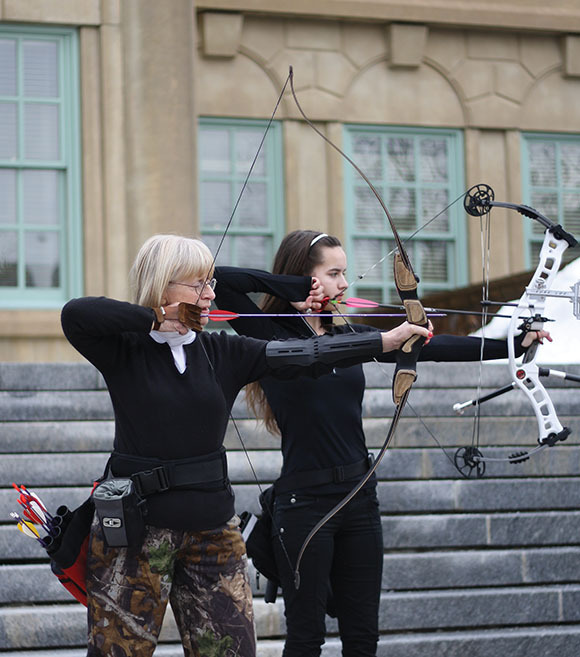 The two, who represent Osprey Archery Club near Shad Bay, about half an hour outside Halifax, approached Corney and asked if she would be interested in training for the Canada Games. McLaren, 73, has been practicing archery under Graves’ tutelage for five or six years. “We could see that (Corney) had talent, that’s why she was eyed out,” McLaren says. She adds that the teen’s involvement in cheerleading and student council prove she is dedicated -a trait trainers seek. Archery clubs were first formed in Canada in the mid-1800s. The Canadian Archery Association was formed in 1927 and is still the dominant national organization. McLaren says the book and movie The Hunger Games has made more young women interested in the sport. For role models closer to home, the first Canadian to win a world archery title in 1967 was Dorothy Lidstone. McLaren was inspired to take up archery based on images of ancient warriors. “I always wanted to shoot while riding a horse,” she says with a chuckle. Marilyn McLaren and Corney enjoy archery for the challenge. While McLaren prefers a traditional bow, Corney uses a compound bow, which has a number of additional parts and looks more mechanical and modern. A long rod, called a stabilizer, protrudes from the front of the bow, balancing out weight and absorbing vibration. A magnifying lens, called a sight, and a level are attached to the bow as well, helping Corney aim. A small tool called a mechanical release is used to pull back the bowstring. Corney explains her hands-on training began up close to the target, so she could focus on body position first. She practiced her stance in front of a mirror with a strap instead of a bow, so she could see what the correct pose looked like, then emulated that pose holding the bow. She progressed back from the target, incorporating aim into her training. Corney can hit a target from as far as 60 metres on an outdoor course, but at the Canada Games, archery is an indoor sport and the shooter stands 18 metres from the target. Practicing the outdoor distances help her improve at the shorter distances, Corney says. Although aim and pose are vital, Corney says the sport is more than just physical. Corney’s favourite part of the sport is the challenge. Originally published in The Halifax Commoner, and on their website.